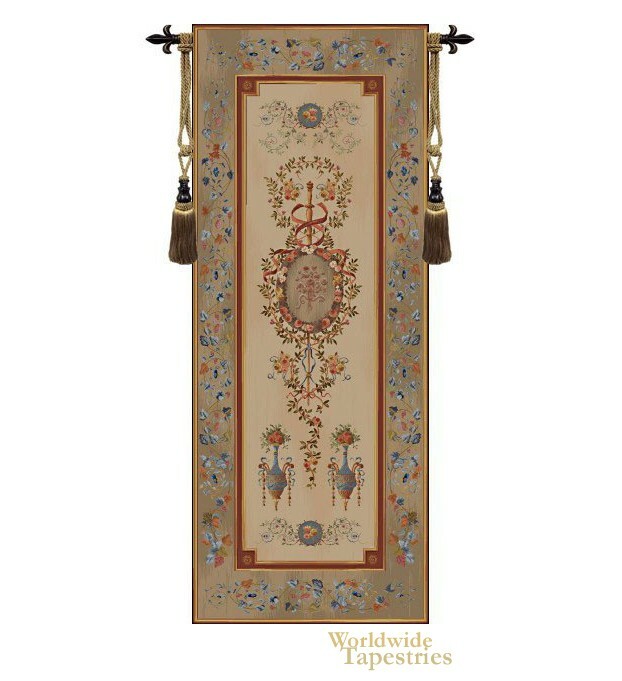 This Portiere Bouquet tapestry, shows a gorgeous French portiere. Like its companion piece Portiere Cupidon, this piece shows the classic style of French works from the 18th century. Tapestries and wall hangings were used to decorate palace chambers with great elegance. Here the violet blues, burnt orange, and tanned hues combine beautifully. Filled with delicacy and detail, this work is a gorgeous design that can be used to bring French classic beauty to any room. This Portiere Bouquet tapestry is backed with lining and tunnel for easy hanging. Note: tapestry rod and tassels, where pictured, are purchased separately. Dimensions: W 30" x H 74"